Image Size: 24 X 13 in. 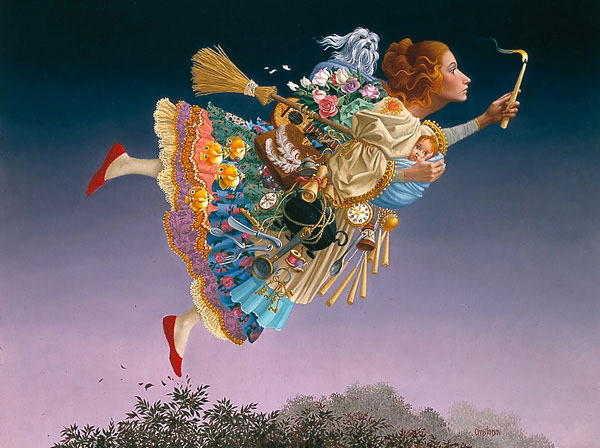 This painting is an homage to artist James Christensen's wife, Carole. He began to contemplate all her roles in life and the many weighty responsibilities she shouldered as a full-time wife and mother of five young children. Women everywhere relate to the need to confidently soar above life's troubles and challenges. In a given day she may shuttle the children, prepare a gourmet feast, keep to hectic time schedules and more, but she always keeps her head up and carries the light of hope to those around her. A delightful gift to honor a wife, mother, grandmother, sister or any heroic woman in your life. Among the important women's roles portrayed in this painting are: Mother, Pet caretaker, Chef, Housekeeper, Leader (Lighting the way with wisdom), and Scheduler.